Dutch Bros Coffee celebrates National Coffee Day by giving back $1 from every drink sold that day to local children's organizations. There is no better way for Dutch Bros to celebrate National Coffee Day than to give back to local youth organizations. On Friday, Sept. 29, Dutch Bros will celebrate National Coffee Day by donating $1 from every drink sold to local youth organizations for the company’s annual Buck for Kids day. Dutch Bros wants to disrupt the coffee industry's approach to this national day and shift the focus to coffee lovers' support for youth in our communities. On Friday, all 292 Dutch Bros locations throughout the seven states in which the company operates will donate $1 from every drink sold to support local youth organizations. Every Dutch Bros location is locally operated, enabling each local team to select a nonprofit that betters the lives of local youth in their community. Dutch Bros celebrates National Coffee Day by positively impacting the communities Dutch Bros employees are grateful to call home. 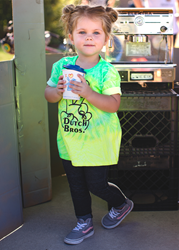 Through Buck for Kids, Dutch Bros partners with local youth organizations doing great work. Proceeds from this day further support nonprofits as they continue to positively mentor, support and, ultimately better the lives of youth throughout the area. To date, Dutch Bros’ Buck for Kids has raised over $1.28 million for local youth organizations with gifts totaling $401,212 last year alone. By partnering with local coffee lovers, Dutch Bros hopes to surpass that total this year. The company’s philosophy is that our youth are the future. Together we can make strides to positively impact their lives and create a better world. To learn the organization being supported near you, click here. Dutch Bros Coffee is the country’s largest privately held, drive-thru coffee company, with over 290 locations and over 7,500 employees in seven states. Dutch Bros serves specialty coffee, smoothies, freezes, teas and a private-label Dutch Bros Blue Rebel energy drink. With a mission to serve as a role model in the community and commitment to doing the right thing, Dutch Bros donates over $2 million annually to nonprofit organizations and local causes selected by local owner-operators.